Red mIllet is a small-seeded grain that grows well in areas that larger grains do not. Used extensively in Africa and East Asia, it is the equivalent to wheat and corn in Western diets. Because of its higher levels of protein and lower production costs, some Westerners choose red millet for its perceived benefits to health and social responsibility. The U.S. Department of Agriculture defines a cup of cooked grain, such as red millet, as one serving. A single cup of cooked red millet weighs about 174 grams and contains approximately 207 calories, with the majority of these calories coming from carbohydrates. One serving of red millet contains 41.2 grams of total carbohydrate. The overwhelming majority of these are complex carbohydrates, the kind that break down slowly in your digestive tract to provide long-lasting energy without undue stress on your pancreas. The serving also contains 2.3 grams of dietary fiber, or 9 percent of the daily value. Fiber helps lower your risk for constipation and other digestive issues, high cholesterol and heart disease. It also makes foods more filling so it can help you eat less and maintain a healthy weight. There are 1.7 grams of fat in a serving of red millet, consisting of about 0.3 grams of unhealthy saturated fat and 1.4 grams of healthy unsaturated fat. 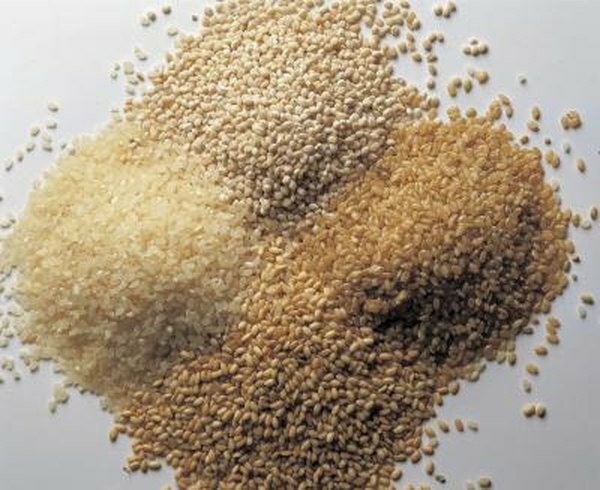 This makes red millet a low-fat food, since this is only about 3 percent of the daily value for fat, but only about 1 percent of the DV for saturated fat. While saturated fat increases your heart disease risk, unsaturated fat can decrease your cholesterol and thus your heart disease risk. One cup of cooked red millet includes 6 grams of protein out of the 46 grams per day recommended for adult women. Because it comes from a plant source, this is an incomplete protein. It contains only some of the amino acids your body needs, so it shouldn't be your only protein source. However, as long as you eat a varied diet and eat a mix of different types of protein during the day this isn't a big concern. Red millet is high in several essential vitamins and minerals, containing between 10 and 20 percent of the USDA recommended daily value of thiamin, niacin, magnesium, phosphorus, zinc, copper and manganese. Thiamine and niacin are B vitamins that help you turn the food you eat into energy. Magnesium and phosphorus are both essential for forming DNA, while zinc helps with immune function. You need copper for forming red blood cells, and manganese for processing cholesterol.